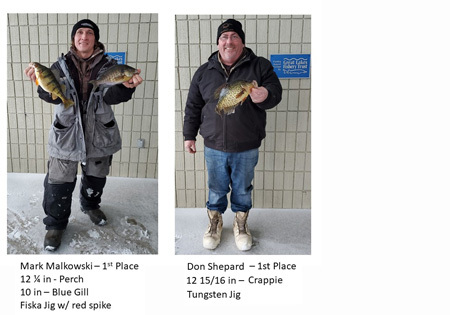 The Gettin' Jiggy Ice Fishing Tournament was held February 16, 2019 at Pere Marquette Expeditions in Ludington. This coincided with Michigan's Free Fishing Weekend. A BIG thanks to all who participated. Some nice fish were caught. 54 entries paying out $180 each for the largest crappie, blue gill and perch. What a beautiful sunny winters day in Michigan to fish. The PME gift certificates went to Shanika Ingle and Ben Chandonnet. Save the date for the next fishing tournament. Finny Slam will be on Saturday, March 9, 2019. This is the Ray Finholm Memorial Tournament, fishing for Steelhead, Pike and Perch. Entry fee is $10...and there is a 100% payout for the longest fish in each category: Bluegill, Crappie, and Perch. You must be in line for measuring by 6pm. At the end of the tournament, free hot dogs will be served at Sutton's Landing down at the river and is included in your entry fee. Contact Pere Marquette Expeditions for details (231) 845-7285.